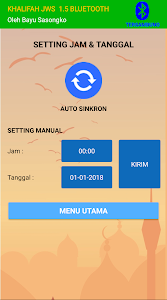 KHALIFAH JWS V1.5 Bluetooth adalah aplikasi yang digunakan untuk melakukan setting pada kontroller Jadwal Waktu Sholat dengan koneksi Wireless Bluetooth. Pairing terlebih dahulu Bluetooth Kontroller di pengaturan HP anda sebelum membuka aplikasi ini. 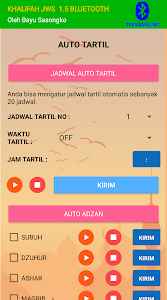 Nama Bluetooth Kontroller : KHALIFAH JWS, Password : 1234. 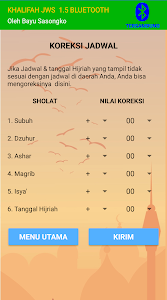 Setelah ter-Pairing, buka aplikasi ini dan tekan simbol Bluetooth di pojok kanan atas, kemudian pilih device KHALIFAH JWS. 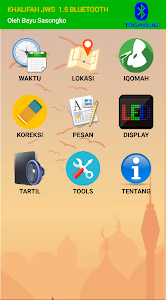 Jika sudah terhubung, simbol Bluetooth berubah menjadi warna biru. 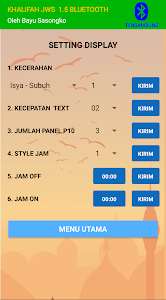 Silahkan laporkan jika ditemui bug di aplikasi ini. 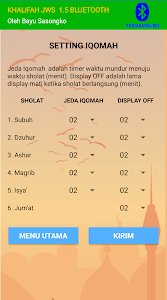 JWALIFAH JWS V1.5 Bluetooth is an application that is used to set the controller of the Prayer Time Schedule with a Wireless Bluetooth connection. First pair the Bluetooth Controller in your cellphone settings before opening this application. Bluetooth Name Controller: JWS KHALIFAH, Password: 1234. 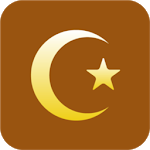 After Pairing, open this application and press the Bluetooth symbol in the upper right corner, then select the KHALIFAH JWS device. When it's connected, the Bluetooth symbol changes to blue. Please report if a bug is found in this application.